After a trip to the doctor’s office, Ericka1073was mortified to hear that she weighed over 340 pounds. That’s when she decided that she needed to change her lifestyle. 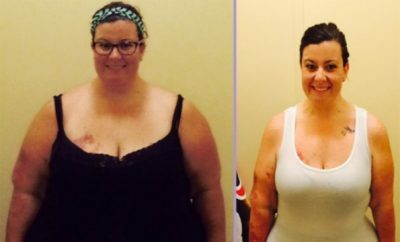 She is using Calorie Count’s tools to guide her eating habits, has added daily exercise and couldn’t be more thrilled with her results! I broke my shoulder last year and put off going to the doctor. I assumed it had just popped out of place. After five days I broke down and went and was informed it was broken. While there I had to get on a scale and it read 344 lbs…THAT was my “Aha!” moment. I’d always known I was a big girl, but that blew my mind. I had no idea I was close to 350 lbs. In the past I always tried the easy route. 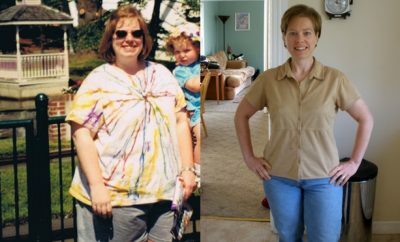 Slimfast, pills…anything that would let me continue to eat the way I was used to, but yet still promised results. Clearly I was delusional, as I have learned there are no secret pills or shakes that are going to melt the fat away. After that day at the doctor I decided I had to do something, but I was going to have to be serious and be prepared to take baby steps. I can’t tell you how many baby steps I took, but it has been MANY! I figured this wasn’t just about weight loss, but a lifestyle change and for someone as stubborn and set in their ways as me, this was going to take a while and I had to be patient, go slow and take baby steps. The first thing I found was “Hungry Girl“. I truly believe she is my guardian angel in disguise. Thanks to her I learned how to eat the foods I wanted to, but just in a different way. Swapping out ingredients has become the norm for me and honestly, I am finding I like many of the recipes just as much or more than their fattier counter parts. 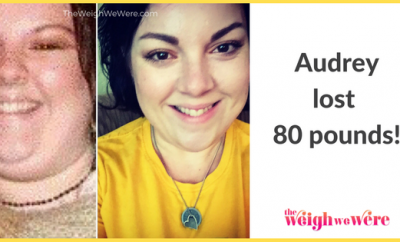 I have many friends that have tried and succeeded on Weight Watchers, but I could never afford it and was definitely not comfortable sharing my progress with strangers. I also found an app that helped me log my workouts that was very user friendly and had a GPS feature built in so I started using that on my hikes and at the gym…which is another place you will now find me frequently. I attend too many Zumba classes to count, lift weights, swim, hike and any other activities that come up that sound interesting I give them a try. It is true what they say…I didn’t put the weight on overnight; it’s not going to come off overnight. This is a lifestyle change and I’m enjoying the journey. I probably don’t use Calorie Count like I should, but I have used it to track an average day here and there to test where my calorie intake is at and enjoy the workout challenges. Most importantly, I look forward to the e-mails with Success Stories that keep me motivated and tips and tricks to keep trying new things. It is truly a huge part of what keeps me motivated! I feel very fortunate that I have lost weight pretty steadily. I stopped logging food and exercise for a while just to test myself to see how I’d do once I reach my goal. During that time I didn’t gain weight, but I didn’t lose. 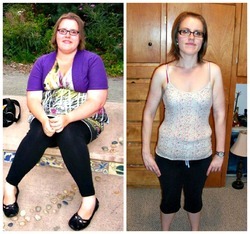 So I feel confident that each of my baby steps have been true steps to a lifestyle change. I have now started logging more often and finally broke my plateau. I started seeing results after about a month, but really noticed after about three. On average I was losing about 10 lbs per month. I realized I was a success when I could stop logging and just continue living and maintaining. I let myself have moments where I have treats and have no guilt about it. I don’t make a habit of it, but if I really want something, I try to find an alternative, but sometimes I let myself just enjoy and I don’t beat myself up about it. I have earned it and by allowing myself to have some small rewards I don’t feel deprived and keeps me going forward. I am extremely active now! I have always been a social person, but I had got to the point I no longer went dancing with friends or anything else I used to love. Now I’m participating in Zumba Flash Mobs and other things I would have never considered before. I have been working on my confidence for a while and to hear people tell me a post I made online encouraged them to try some new workouts just makes me feel good. 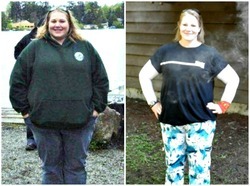 My gym recently asked me to share my story at their Biggest Loser kickoff…I was truly honored. One thing I didn’t think of before I started this journey was the fact I would need all new clothes. I can’t remember the last time I wore anything without a 3 or 4 before the X. Now some of my clothes sizes don’t even have an X! Trying to wrap my head around that has been one of my greatest challenges. I’ve always shopped the plus sizes and now I don’t have to. It’s still an adjustment that is taking time. Recently I had a reflection in a mirror and thought to myself…that girl looks pretty good. Then I realized I was looking at myself and had to hold back the tears. I didn’t think I’d ever look in the mirror and be able to truly smile at the reflection in it. It’s a surreal feeling. I am still working toward my goal. Take baby steps – because once you conquer one step, it’s that much easier to take the next one. Try new things. Allow yourself to try one new food or one new exercise and get used to it before adding another if that’s what you need to do. Reward yourself along the way. Maybe a new shirt, a night out, even a Redbox movie. Doesn’t have to be a big reward. Just something you wouldn’t normally do. If you slip one day, do not beat yourself up about it. Log it to hold yourself accountable and use it as motivation to keep moving forward. Most importantly, have fun! I have loved every step of my journey and look forward to each and every day to see what it brings me. All I think to myself is what took me so long?